UPDATE: Congrats to winner Scott S. of Union, OH! 90's grunge rock icons, Soundgarden are back after a lengthy hiatus with the release of their highly-anticipated new album King Animal. The album is a welcome return to form and it's like they never left with Chris Cornell's trademark soaring vocals and Kim Thayil's thick and rhythmic guitar sludge highlighting an excellent new set of anthemic and driving songs. In the spirit of Christmas, a copy of the new CD can be yours thanks to the band, their label Seve Four/Universal Republic, and Atlas And The Anchor! 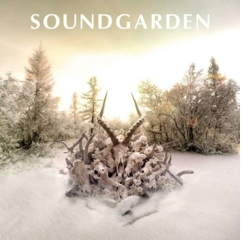 Just send an email to atlasandtheanchor@hotmail.com with the title of your favorite Soundgarden song and one winner will be chosen at random next Friday, 12/21/2012.